Early-bird registration ends October 28, 2018. The registration fee for early-birds is $65 and includes a t-shirt. If you register from October 29-November 9, the registration fee is $75 and does not include a t-shirt. Download a schedule for DakYouth HERE. (Updated 11/7/18) **Note: The Skit Guys will be performing Saturday night rather than on Friday as originally scheduled. A downloadable promotional video to use with your youth group. 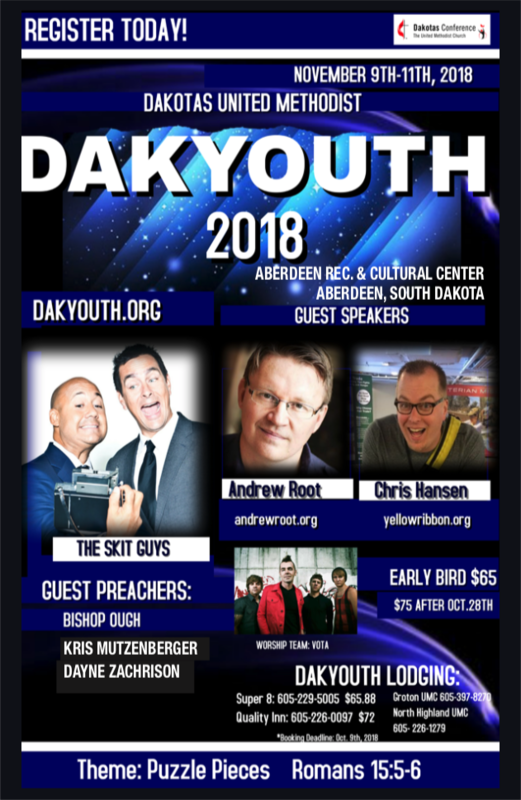 A downloadable invitation from the Skit Guys to the Dakotas for DakYouth 2018.